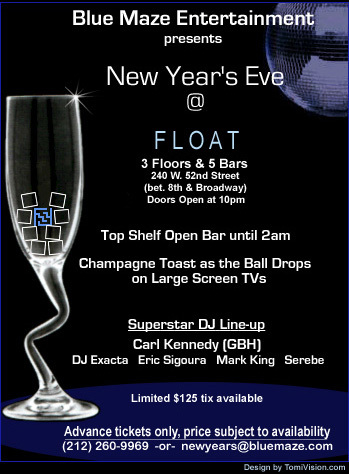 Blue Maze Entertainment teamed up with NYC promoter Jon B to ring in the New Year at Float, one of the hottest night clubs in the city. 5 bars and 3 floors weren't enough for this crowd. DJ Carl Kennedy (GBH) led the DJ line-up, followed by Exacta, Eric Sigoura, Mark King, & Serebe. There was open bar til 2am and a champagne toast as the ball dropped on large screen tvs. The crowd exploded as Guiliani swore in Bloomberg after midnite.... NYers still represent!